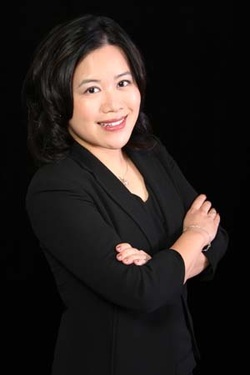 Vivian W. LEE is a Chinese Canadian entrepreneur living in Greater Vancouver, BC, CANADA. She was born in Hong Kong in August 1973. She immigrated to Vancouver at age 15 in January 1989. Her family was living in Burnaby, BC at that time. Her parents were born in Shanghai (mom) and Guangzhou (dad), PRC. Vivian is the eldest of four children (3 girls and one boy). In her teenage years in Canada, she was always an active volunteer in local communities: a kids program leader at S.U.C.C.E.S.S., a green environment ambassador for Environment Canada, and a team leader for the Girl Guides of Canada. She also enjoyed her leisure time in a Multicultural Club in her high school. At age 21, she was awarded as a "Young Ambassador" traveled to the capital city of Canada -- Ottawa, meeting different political party leaders and ministers in Canada. Later that year, Vivian and her team won the Ming Pao Newspaper debate. They had to analyze and debate various social, economic and political issues against some experienced local news anchors from a Chinese Canadian radio station. By age 24, she had completed two university degrees and two certification programs (BSc, CIS, MBA, CIM). While advancing in her study, Vivian also gained lots of valuable business experience as a marketing coordinator for Asia-Pacific Economic Cooperation (APEC) 1997 -- the Business Matching Program for Small Medium Enterprises (SME). Since then, Vivian has a new passion in helping business to promote cross-cultural communication and negotiate international projects. At age 26, Vivian was, one of the youngest instructors, teaching an all-new "eMarketing" courses at Simon Fraser University (SFU) and British Columbia Institute of Technology (BCIT). She designed, developed and launched a few eMarketing / eCommerce courses for 200+ full-time and part-time students. In her early career life, Vivian was working for several companies from an Internet startup to a Fortune 500 company. She was a Customer Service Coordinator at the HSBC Canada head office, in Vancouver Main Branch. She was a Marketing Manager at Honeywell Measurex, a division of Honeywell, that built paper-making machines. Then, she was an Internet Marketing Manager for a start-up that had an online banner advertising network. By age 30, Vivian had completed her doctoral dissertation on "CI Values: the Relationship between e-Business information and Competitive Intelligence in the Digital Era". She also presented her dissertation paper at the Strategic and Competitive Intelligence Professionals (SCIP) conference in Boston 2004. Then, for more than a decade, she has built on her vision, dreams and goals of helping business owners to achieve results. She has helped many small business owners in different industries and markets -- to create, design and implement their marketing programs and sales promotions. On the other hand, Vivian has also helped clients and associates to facilitate cross-cultural communication and negotiate different global commodity deals, international cooperation projects, and joint venture partnerships. In 2014, Vivian started to focus her business on what she is truly passionate for... writing. She was a member of American Writers and Artists Inc. (AWAI) and International Travel Writers and Photographers Alliance (ITWPA). She had completed various copywriting programs: Accelerated Copywriting, Master Copywriting, Financial Market Copywriting, Website Audit, and Dan Kennedy's Info Marketing. She was also a "Certified Dan Kennedy Copywriter for Info-Marketers". Vivian is fluent in English and Chinese (speak both Cantonese and Mandarin -- read and write both traditional and simplified characters). She can say HELLO in more than 10 languages, but she wouldn't count it as fluent for business practice. She is married, living with her husband Nigel, her son Nicholas and her daughter Meaghan in Richmond, BC (part of the Greater Vancouver, BC, CANADA). Vivian enjoys meeting new people and helping them to achieve success. Follow her on Twitter @DrVivianLee to learn the latest business, financial and market trends... as well as latest sales market tips and special offers. ollow her on Facebook page www.facebook.com/globalmcn with DAILY posts and updates about the world's current events, geopolitical updates, and galactic updates.